It’s time to ease your suspense, following my last post, asking for your votes. Yes! Thank you all you wonderful peeps. 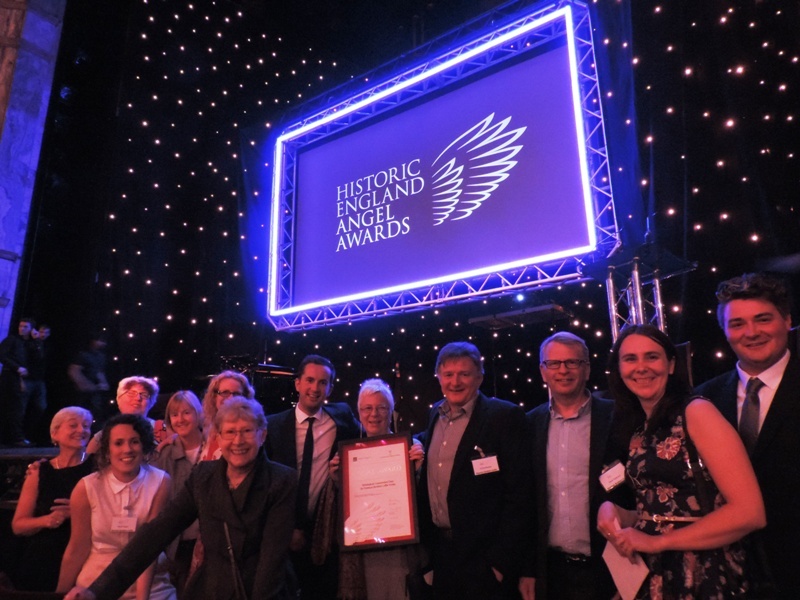 As a result of your support and enthusiasm, Birmingham Conservation Trust won the Heritage Angel, Historic England and Telegraph People’s Favourite award for our restoration of the Newman Brothers Coffin Works. It’s a long title, but a very worthwhile prize that means a great deal to all of us, as you can see from the short film I made of the acceptance speeches made by Simon Buteux and Elizabeth Perkins, respectively our current and former Directors, who have worked to hard to see the restoration project succeed. 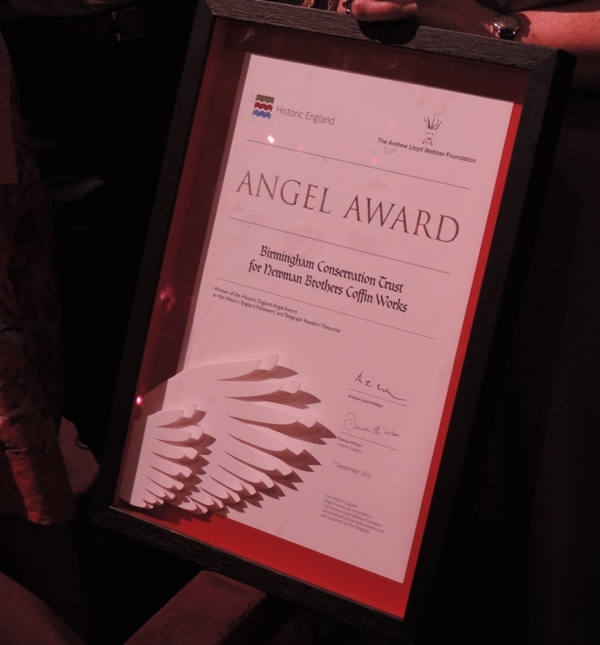 The Heritage Angel Awards are organised by Historic England and sponsored by the Andrew Lloyd Webber Foundation. As a result, Sir Andrew’s Foundation paid for 12 of the BCT team to attend the ceremony in the Palace Theatre, London, on 7 September 2015. Consequently, as well as bringing along the BCT staff, and Jane Arthur, chair of the BCT Board, Simon was able to invite the project manager, Kate Dickson, project architect, Ed Kepczyk, another trustee, (me! ), and 3 volunteers: David, Pam and Owen. The ceremony provided a great opportunity to see the high standard of exciting restoration work taking place around the country. After the show, we mingled with the other nominees at a reception, where we snaffled as many mini-cones of fish & chips as we could, whilst comparing notes and sharing tales of restoration highs and lows. Two days later, an article about our success appeared in the Daily Telegraph – considering he was interviewing 12 very over-excited people, the journalist did a remarkably accurate job! We are very grateful to you, our friends and supporters, as well as those of Heritage England and the readers of the Telegraph, for voting so strongly in our favour. Please do come and visit us now so that you can see the award you helped us to win!